MG Chemicals have been a market leader in conformal coating technologies as well as many other electronics materials for many years and provide excellent technical support and highly competitive pricing. Conformal Coatings designed, manufactured and supplied by MG Chemicals include Acrylic, Polyurethane and Silicone materials and these coatings can be used within any facility using a variety of different techniques including dipping, robotic spraying or brushing. 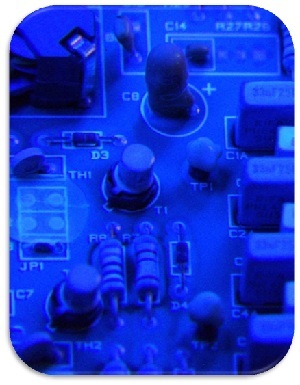 Contact SCH Technologies now to discuss your conformal coating needs. A conformal coating is a protective non conductive dielectric layer that is applied onto the printed circuit board assembly to protect the electronic assembly from damage due to contamination, salt spray, moisture, fungus, dust and corrosion caused by harsh or extreme environments.It is normally used on electronic circuit boards that are exposed to adverse environments where heat, chemicals and / or moisture are prevalent. Coating also can prevent damage from rough handling, installation, reduction of mechanical and thermal stress. It can prolong the life of the product during its operation and at the same time it can help to increase the dielectric strength between conductors enabling the design of the PCB to be more compact and small. Finally, it also acts to protect circuitry and components from abrasion and solvents. Why use Conformal Coating to protect my electronic circuits? Why use RFI EMI shielding coatings to stop interference in my electronic circuitry and how does it work? Can I waterproof a printed circuit board (PCB) with conformal coating? Which application method should I choose when applying conformal coatings, shielding paints and lacquers? What international or national standard should I be using for application and inspection of conformal coating? Is it advisable to clean my boards before conformal coating? What are the advantages disadvantages of this and how clean do my PCB’s have to be before applying the coating?